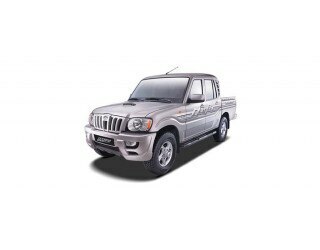 Dec 11, 2018: The Mahindra Scorpio Getaway is one of the best pick up trucks and is based on the popular Scorpio SUV. It churns out its power from a 2,179cc four-cylinder, BS-IV compliant engine that pushes out up to 120 bhp power along with a peak torque of 280 Nm. The transmission duties are done by a 5-speed manual gearbox. It is capable of getting to a maximum speed of 100 kmph and offers a mileage of 11 kmpl. The pickup has a payload capacity of 600 kilograms. The vehicle comes with a seating capacity of six peoples including the driver. Also, inside the cabin, there is a powerful AC, a rack and pinion steering and comfortable seats are offered, much to the convenience and convenience of everyone. Disc brakes take care of the braking. As for the suspension setup, the pickup features a double wishbone at the front and Semi-elliptical leaf spring at the rear. I like this truck because of its milage and comfort .One of beautiful thing I like is colour variation in the trucks and also the average given by the truck. India’s one of the most famous SUVs, Scorpio is also available as a pick-up truck with the name of Scorpio Getaway and is every bit same as the SUV version. However, the company sells it as a personal vehicle, but it could be used as a commercial one, owing to its big loading deck at the back. Scorpio Getaway is actually the pickup version of the SUV with loading capacity and has same aesthetic features as well as interiors. Its faster turnaround time, longer wheelbase, power steering, extra safety features and healthy mileage makes it one of the most popular pickus among buyers. Backed by SZ CRDe 4 Stroke 2.6 Litre Turbocharged DI Diesel engine, it is entitled to produce handsome power of 15 bhp @ 3,800 rpm and 277.5 Nm torque @ 1,700 - 2,200 rpm. Detailing the performance further, its 5-speed manual gear transmission box takes it to a top speed of 100 km/h and with Multi Disc Wet Type clutch, the power transmission is smoother than ever. With only wheelbase option of 3,040 mm and turning radius of 5,600 mm, Scorpio Getaway can easily navigate narrow street roads and sharper turns. Talking about overall dimensions, it is 5,118 mm long, 1,850 mm wide and 1,874 mm high and could lift up to a maximum Gross Vehicle Weight (GVW) of 2,650 kg for 4WD option and 2,550 kg for 2WD option. Being basically an SUV, Scorpio Getaway has power steering which is able to get tilted whenever required to ensure that driver stays fresh even while on long trips. Also with this power steering, its easier to maneuver the pickup on any given terrain. For suspensions, the company has offered Double Wish-bone with Torsion Bar springs at front and Semi-Elliptical Leaf Spring at the rear with Rigid Axles to support them at both ends. Coming to the brakes, Scorpio Getaway is equipped with Disc brakes at front and Drum brakes at rear to help driver stop the pickup at any given speed with load full to its capacity. Additional safety has been catered by providing various features like Voice Assist System, Crash Protection Crumple Zone, fire retardant upholstery, collapsible steering column, tubeless tyres and seat belts. Aesthetically, Scorpio Getaway is very much an SUV with features like sporty decals, provocative bonnet scoop, aerodynamic structure, new fog lamps, powered OVRMs, follow me headlamps and stylish body structure. The cabin is equipped with two-tone interiors, mobile charging points, illuminated key ring, plush seats & upholstery, individual armrests on 1st row, AC, heating and ventilation and overall drive comfort.